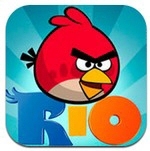 Despite sending out a newsletter advising incoming Angry Birds Rio and Angry Birds updates Wednesday, few expected Rovio Mobile to release the second half of “Carnival Upheaval”, a 15 level update, so soon. If Rovio is going by what they reported on Wednesday, another set of “Mine and Dine” levels for the original Angry Birds game will launch before the calender turns to august. The update is now available for download on the iPhone, iPad, and iPod Touch.